Hat Head Giving you Flat Hair? The Cure for Fine Haired Girls is HERE! This has been the harshest, most brutal winter I have ever lived through – including the winters spent in frostier, colder, snowier Montreal. Toronto has experienced a deep freeze with intermittent snowstorms since the beginning of December, and with my trusty iPhone weather app showing continued temperatures dipping well below -15 and those frown-inducing flurries, it doesn’t look like there’s an end in sight, at least in the near future. Feeling frozen, windburned, and chilled right to the bone is enough to make any Canadian question their loyalty, even with our superior syrup and killer hockey team. This is especially true when after finally scurrying indoors again after venturing out into what feels like the Tundra, you begin to peel off layer upon layer of wool, fleece and goose down only to reveal the dreaded hat head hair. Flat, lacklustre and generally shortfalling of any trace of oomph, flat hair is almost as bad as enduring having to put on two hats to stay warm in the first place. 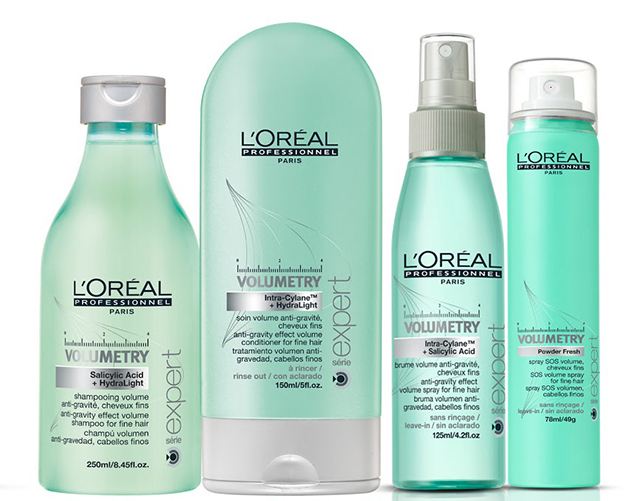 Saving the (bad hair) day, L’Oréal Professionnel’s Volumetry collection makes you take your hat off and shake out your hair like a 90’s Outrageous shampoo commercial. Winner of the beauty ruler Allure magazine’s Beauty Breakthrough Award in 2013, you know this is the stuff dreams are made of. Comprised of an anti-gravity shampoo, volumizing conditioner, root lift spray and an SOS volume spray, this line has all the bases covered to ensure your limp hair has lift. Formulated with Hydralight Technology to moisturize and salicylic acid to gently cleanse strands, the shampoo and conditioner combo whisk away dirt and oil to reveal clean, soft and refreshed hair – they feel supremely light and fresh, and have a delicate herbacious, fruity scent. The volumizing lift spray features Intra-Cylane Technology, which works from the inside out to densify each strand individually, actually making hair thicker. This is an incredibly unique system as most volumizing products sit on top of hair, feel stiff, or deflate as soon as you touch your hair; I don’t know about you, but touching and toussling my strands can not be an off-limits action. An incredibly effective and beautiful product that improves with continued use? It’s nearly too good to be true, but trust me: this stuff truly works. Fellow fine, flat, limp haired girls, you’re welcome!